So for fringe theatre the Menier Chocolate Factory to make this particular show their big Christmas production this year was a risky move. 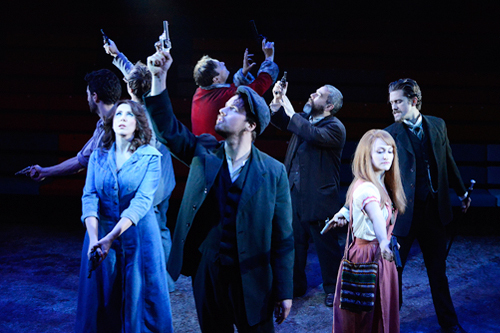 But thanks to a visionary revival by director Jamie Lloyd and a stellar cast, which includes the likes of comedienne Catherine Tate, Broadway's Aaron Tveit and West End's Simon Lipkin, this musical hits the bull's-eye - something which many of the would-be assassins in the show weren't able to. Entering the small theatre space in the Menier Chocolate Factory, was like walking into the colourful and crazy world of a carnival, but with a sinister and unsettling touch to it. This feeling was amplified when the grotesque Proprietor (Simon Lipkin) made an appearance. Covered in white, red and blue streaks of paint he emanated a creepy clown, setting a threatening mood as he showed the audience the assassins and the presidents they targeted. The individual stories could have easily been disconnected from one another, but they were held firmly together by the intimate staging - the majority of the cast is present on the small stage even when they're not the focus of attention - and the Balladeer (Jamie Parker), who narrated several of the assassination attempts through beautiful, folky songs, before tying everything together in a clever twist towards the end. Director Jamie Lloyd has been on a winning West End streak with Urinetown, The Commitments and Trafalgar Transformed at the Trafalgar Studios, and Assassins is another hit he can add to his ever-growing resume of successes. Not the first time I've seen the Sondheim show, this production is highly imaginative and elevated the story from a depressing fare to a thought-provoking and darkly funny musical. 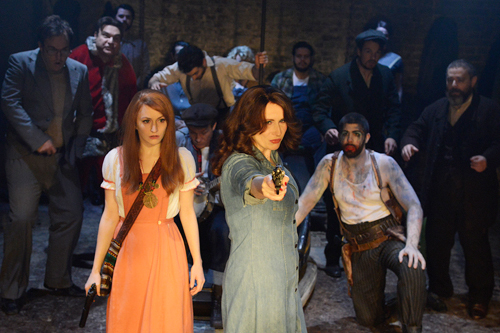 The cast unanimously excel, with a hugely hilarious performance by Catherine Tate as the spaced-out Sarah Morgan; Aaron Tveit showing true Broadway charisma as John Wilkes Booth; Stewart Clarke's understated turn as Giuseppe Zangara showing he has come a long way from his West End debut just two years ago; Jamie Parker's surprisingly gentle portrayal of both his characters; and the sinister, ever show-stealing Simon Lipkin. With an imaginative direction and staging, and an all-around phenomenal cast, the likes of which are rarely seen treading the boards of a fringe stage together, this production is a sure-fire hit. 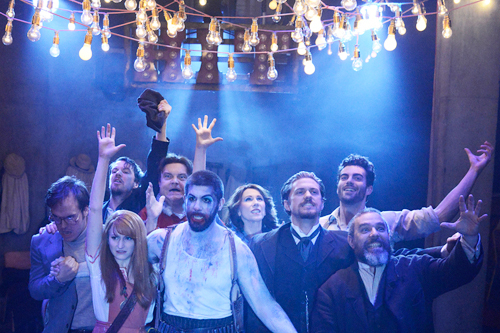 Assassins is playing at The Menier Chocolate Factory in London until 7 March 2015, you can buy tickets here.